Each of these serves a unique purpose when working on themes and plugins especially if you care about localization and using the latest version of the WordPress API. The downside is that it can be somewhat of a pain to install these each time you setup a new development environment (depending on how you actually setup your local machine). But thanks to the guys over at WordPress VIP, this process for getting up and running with the necessary suite of plugins for WordPress developers is much easier. About a month ago, the team released the first version of Developer Plugin (which is also available on GitHub). That’s why we built-in the Developer plugin. It’s your one-stop resource to optimally configure your development environment by making sure you have all the essential settings and plugins installed and available. 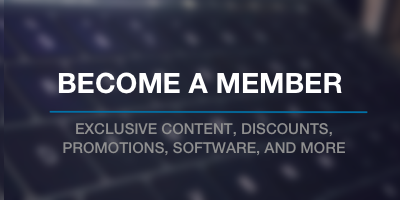 If you’re doing any type of development on the WordPress platform – be it as a hobby or in a professional capacity – I highly recommend checking out this plugin. One click install for all of the plugins recommended for developers. 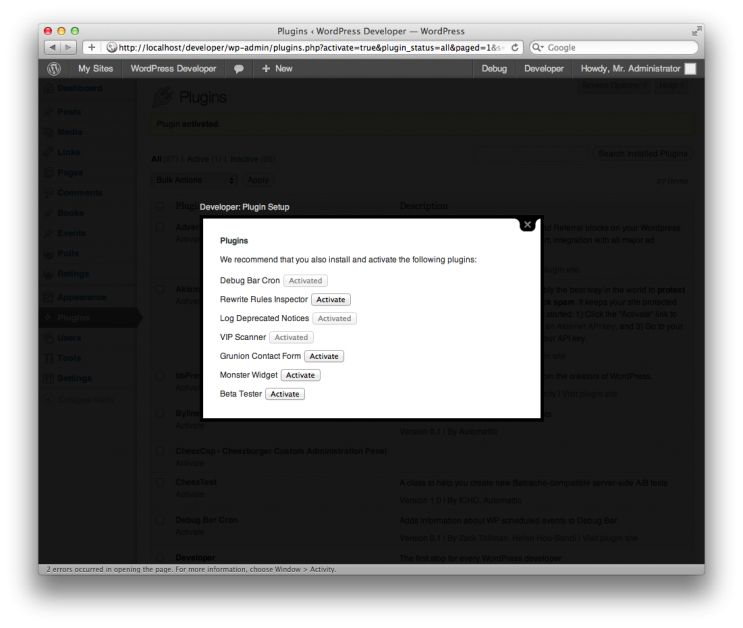 The Developer Plugin status page once the plugin is installed and configured. For what it’s worth, Developer Plugin is replacing my usual set of tools and I definitely suggest giving it a try. My guess is that once you start using it, you won’t go back to anything else. 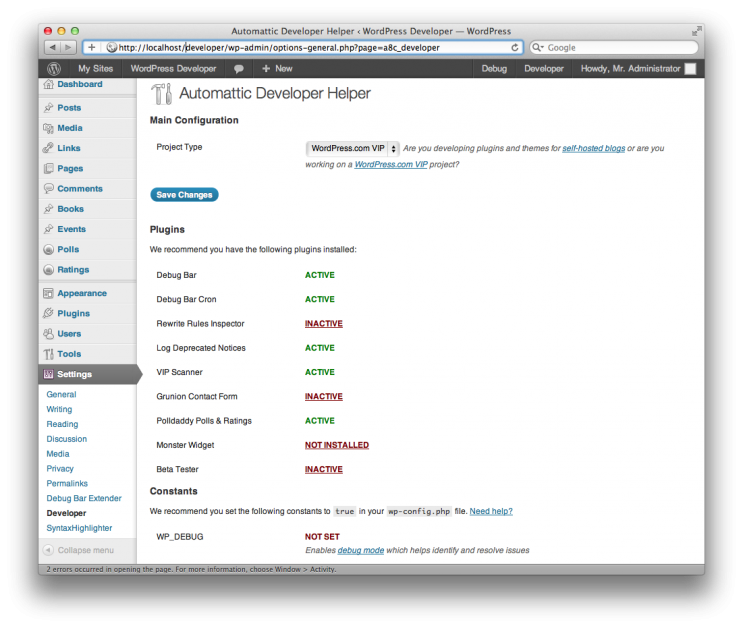 It makes it much easier to know you’ve got your environment configured in an optimal state of development and it’s backed by Automattic. Nice summary, Tom. I’ve been meaning to switch over to the Developer Plugin and give it a go myself but haven’t had a chance yet. Looks good! About time this was simpler and more integrated. Agreed! Exactly why I wanted to help get the word out about it :). Great list Tom. I’m surprised there is no mention of Debug Bar. Yeah – that may because some of the same functionality is duplicated in one of the other tools. Not sure myself, though. Also demantion for Debug Bar and Sub-plugins for Debug Bar, like Cron or Transient. Also I like Debug Objects; many possibilities. Frank – was not familiar with Debug Objects. Thanks for adding this to the mix! welcome, maybe other users have new functions and ideas. *hint: the developer plugin works not very fine on wp multisite, I have the install js very often, in each blog of the network.